A sub­stra­te is nor­mal­ly used as the medi­um for cul­ti­vat­ing plants. But Berlin’s Schau­büh­ne Thea­t­re cul­ti­va­ted some­thing very spe­cial in peat pro­vi­ded by Klasmann-Deilmann Chi­na: during its tour of Chi­na, the Schau­büh­ne Thea­t­re brought peat onto the sta­ge for its pro­duc­tion of Shakespeare’s Richard III. “A hor­se, a hor­se, my king­dom for a hor­se” are the last words spo­ken by the tyran­ni­cal king Richard III as he flees from the batt­le of Bos­worth befo­re being cut down by his rival. 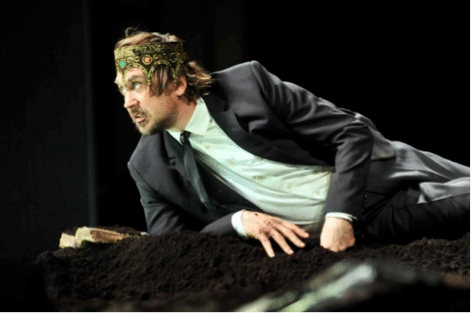 Mar­ked by natu­ral defor­mi­ty, in Shakespeare’s play the king plays the role of a vil­lain. Mur­ders and intri­gues help him to gain the thro­ne, even though his reign foun­ded on bloo­dy deeds does not last long. Direc­tor Tho­mas Oster­mei­er turns the gloo­my his­to­ri­cal play by Eng­lish play­w­right Wil­liam Shake­speare into a peaty affair: for its per­for­man­ces in Har­bin Grand Thea­t­re and in Tian­jin Grand Thea­t­re in Chi­na, the thea­t­re ensem­ble with lea­ding man Lars Eidin­ger acted on a sta­ge cove­r­ed with peat. Sup­plied by Klasmann-Deilmann Chi­na. Up until last year, Berlin’s Schau­büh­ne Thea­t­re at Leh­ni­ner Platz also obtai­ned the peat nee­ded for its pro­duc­tions from Klasmann-Deilmann. Back then, it was a broo­ding Prince Ham­let who wan­de­red in peat across the sta­ge to ask that most phi­lo­so­phi­cal of all ques­ti­ons: “To be or not to be?”. The coope­ra­ti­on began alrea­dy back in 2010. At that point in time, the Schau­büh­ne used our Pot­grond P for its pro­duc­tion. The first cul­tu­ral appearan­ce for one of our substrates took place in spring 2007 when Düsseldorf’s Schau­spiel­haus Thea­t­re per­for­med Feder­i­co Gar­cía Lorca’s “Blood Wed­ding”. The gloo­my atmo­s­phe­re of the play was under­li­ned by a crypt-like sta­ge set with one of our black peat-based substrates on the floor. At the end of the sea­son, the recy­clab­le soils were used for soil impro­ve­ment in Düsseldorf’s open spaces.